The Cheapest Place to Buy an iPhone 5 is Walmart: $127! You may already know that the cheapest place to buy a new iPhone 5 is usually Walmart, but wallyworld is outdoing itself right now and offering a brand new iPhone 5 for only $127! Yes, that’s a whopping $60 cheaper than their already lowest price of $187, and you can pick up that stellar offer with two-year carrier contracts from Verizon, AT&T, and Sprint. What’s the catch you ask? There isn’t one really, except that you have to go into a Walmart store to make the purchase and get the additional $60 discount. The deal appears to only be valid for the base 16GB model, for either black or white colors. Of all the places where you can buy an iPhone 5, Walmart is quickly becoming the best overall deal for bargain shoppers and for anyone looking for some seriously steep discounts. If you’ve wanted a new iPhone and the price was holding you back, you won’t be able to beat this one. Move quick and find a local Walmart store to lock in the price, the deal probably won’t be active for long. Sure, go ahead and support Walmart undercutting everyone else. When they drive everyone else out of the market you’ll be glad you saved that money. Or not. Yes. And when that happens, it will present new opportunities for other creative minds to compete in new ways. That’s the natural turn in a free market and it’s good. I don’t see anyone complaining about how disruptive Internet companies like Amazon are. They’re doing more to disrupt local businesses than Wally World is these days. Went to/called 6 local stores and none of them had the phone. I went to a few and they had some, however, most of them were Verizon or Sprint. I had to try five stores and finally ended up in Green Bay and they had the at&t ones. Anyone looking for them better hurry! The sign in the store said the sale only goes through Jan 12th. 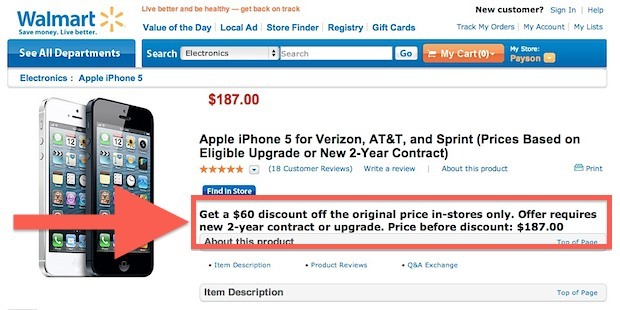 As far as Wal-Mart undercutting everyone else… That’s retail – Best Buy or anyone else would, and do, the same thing. I commend Wal-Mart for promoting a quality product and not the usual low quality junk. I went to 2 Wal-marts, both said they did not carry Sprint iPhones 5. I then went to BestBuy, ($147.00 or something close to that) with 3 people in front of me, I stood in line for 45mins and walked out. I then went to Sprint, I was treated like a KING and was happy to pay the $199. Great Customer Service and a knowledgeable sales staff still rules ! Does either one have iphone on the boost network?